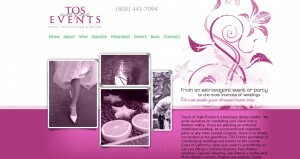 Laura Robertson, founder of TOS Events – Event Coordinating and Design Studio, announced her new website, www.tosevents.com, on Monday. TOS Events is dedicated to alleviating the stress and anxiety associated with planning an event or wedding. Laura wanted her website to reflect the image and distinctiveness of her business. She requested a modern, fresh, simple site that was easy to navigate and explored the true nuances of the weddings and events that she helped produce. Website design is like the cover of a book or the window of a boutique. Laura approached her website the same way she orchestrates her weddings…with attention to detail. If you are interested in planning an event or wedding in missions of Santa Barbara, parks of San Luis Obispo, wineries of Paso Robles, or the castles of San Simeon….San Luis Obispo wedding planner Laura Robertson, can assist you. Take a peak at www.tosevents.com. Like this article? Get more industry tips delivered to your inbox each month. Keith Humes is Rosemont Media's CEO and Founder. Since 1998 Keith has been at the forefront of Internet Marketing with Surgeons and Dentists. He continues to stay ahead of the curve and offers innovative insights to the world of healthcare marketing. Keith also lectures nationally at leading industry events, such as the American Society for Aesthetic Plastic Surgery, American Society of Plastic Surgeons, American Academy of Cosmetic Dentistry and the Dallas Rhinoplasty Symposium. Keith is an avid fisherman and master-griller. Next to fishing, Keith’s favorite activities include surfing, and spending time with family & friends.